Which Philosophers Lived Their Thought? Why read Diogenes, then, if he is so unreliable? Really, it boils down to two reasons: 1) he is all we have for much of the territory he covers, and 2) he is very entertaining. A common reader will have to read him with a huge grain of salt; a scholar will have his own sources to which to refer. But without his work there would be a huge lacuna in what we know of ancient Greek philosophy. Hardly anything is known about Diogenes himself. The Oxford Companion to Classical Literature tells us that he “probably lived in the first half of the third century AD, but about his life nothing is known.” Some character traits, however, do come through the work itself. Diogenes was industrious, a “magpie,” as the editor of this volume, James Miller, puts it. He thought highly of his own epigrams on the deaths of the philosophers he wrote about (it is doubtful any reader today would agree with his assessment). Diogenes thought philosophy was the most important thing in the world, and if a philosopher did not live his philosophy, especially as he approached and endured the moment of death, Diogenes mocks him with one of his epigrams. Diogenes comes across, in short, as a vain but dedicated historian of philosophy. He also regales the reader with many bawdy stories, of which there are many, of all sexual varieties, about his subjects. The manuscript history of the Lives is too complicated to delve into here, but there are three excellent essays about it in the volume. Suffice it to say that it is of epic complexity. Not so complex, but puzzling to modern scholars, is how Diogenes organized his Lives. Rather than our way of looking at philosophy through periods now named pre-Socratic, then Socratic, Platonic, and Aristotelian, including the Cynics and Sophists as offshoots, then the Stoics and Epicureans, Diogenes begins with those whom he calls, “Sages,” such figures as Thales, Solon, and Periander, the latter two normally thought of as rulers and politicians. Be that as it may, the typical life in Diogenes follows a pattern. First comes a biography of the philosopher, often including anecdotes that contradict one another, and also often including the story of how the philosopher first decided to live a philosophical life. Sometimes this calling, quasi-religious in nature, comes through books, more often through an encounter with a teacher. The life works up to the climax, which is the death of the philosopher, often followed by one of Diogenes’s lame epigrams, approving or disapproving. After the life, which can include comments from other philosophers, comes an account of the philosopher’s teaching. This too is often self-contradictory, as if Diogenes was picking up one book and copying down what it says about the subject, then another, higgledy-piggledy and without acknowledging the contradictions. He will then list the works of the philosopher under discussion and then mention any other men by the same name and what they were known for. The only two books completely dedicated to one philosopher are Book 3, “Plato,” and the last, Book 10, to “Epicurus.” The most pages, however, are devoted to Zeno, the founder of Stoicism. Diogenes the Cynic, who walked around with a lantern in the daytime looking for a good man also gets a lot of pages. In many ways, however, Book 10 is the most valuable book in the Lives because it includes three original letters by Epicurus giving the essence of his teachings. The book itself is beautifully done. James Miller sets the stage superbly—“we behold a meticulous codified panorama of the ancient philosophers”—and the illustrations include not only the usual Greek and Roman statues but many modern works of art inspired by ancient Greek philosophy. Besides the sixteen scholarly essays there are also a guide to further reading and a glossary of ancient sources. For Diogenes, philosophy was not an academic exercise, a search for truth that never touched the world. This is why in later years Nietzsche changed his mind about him. 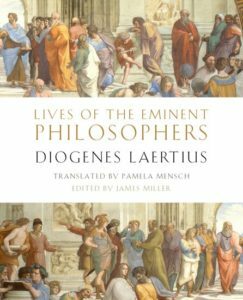 “I for one prefer reading Diogenes Laertius,” he wrote. “The only critique of a philosophy that is possible and that proves anything, namely trying to see whether one can live in accordance with it, has never been taught at universities; all that has ever been taught is a critique of words by means of other words.” One does not have to totally agree with this statement—what about the Irish monks who saved Western civilization, Friedrich?—to acknowledge its heft of truth. Frank Freeman writes from Saco, Maine.